Patients who start radiation with an opening below 40mm. They present with a compromised oral opening and even small losses can push them into clinical trismus of <35mm MIO. Otherwise, we recommend that you track your patients MIO weekly or monthly during the first year post-RT. If your patient shows MIO loss of 10% or more (5mm), you should quickly start them on stretching therapy with a device to limit the loss of opening. Preventing MIO loss is much easier than treating trismus to increase their opening 24.
Who is at risk of developing trismus? A variety of risk factors are correlated with the development of trismus in head and neck cancer patients, including T-stage7,14, age19, and flap surgery9. But the biggest risk factor for the incidence of trismus is radiation therapy. There is a steep correlation16 between intensity of radiation and trismus, with as little as 15Gy capable of causing trismus12. 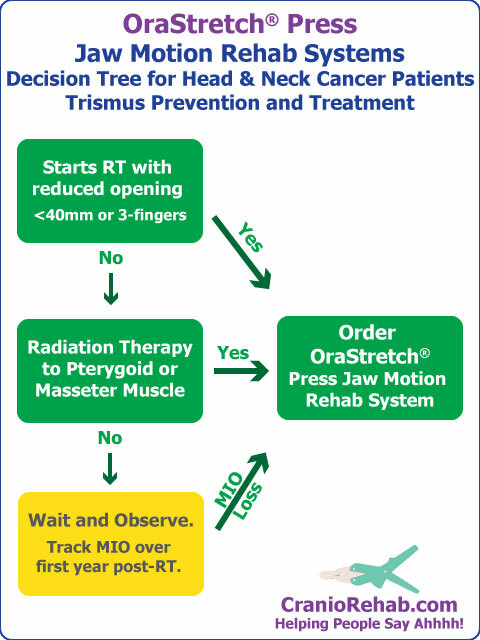 More specific studies have shown that RT on nasal cancer (NPC) patients show incidence of trismus in 62-85% of patients7, 9, 23, with ~90% of patients developing trismus with RT to the pterygoid muscles8. The other high risk factor for patients is an already limited opening. The average adult oral opening is approximately 50mm. A recent study of trismus found that the highest risk factor was patients starting with <40mm MIO128.